Hedge funds and large money managers usually invest with a focus on the long-term horizon and, therefore, short-lived dips on the charts, usually don’t make them change their opinion towards a company. This time it may be different. During the fourth quarter of 2018 we observed increased volatility and small-cap stocks underperformed the market. Hedge fund investor letters indicated that they are cutting their overall exposure, closing out some position and doubling down on others. Let’s take a look at the hedge fund sentiment towards Hasbro, Inc. (NASDAQ:HAS) to find out whether it was one of their high conviction long-term ideas. Is Hasbro, Inc. (NASDAQ:HAS) a buy right now? The smart money is reducing their bets on the stock. 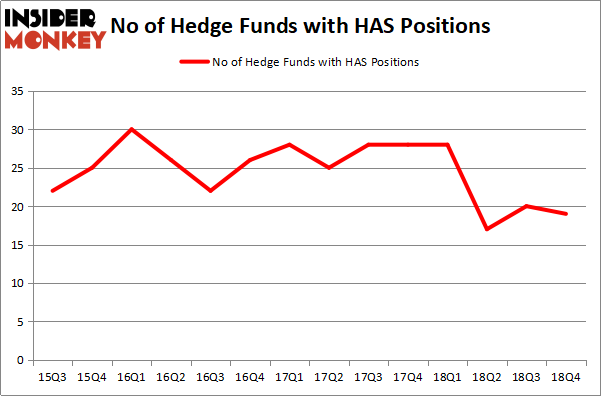 The number of bullish hedge fund bets shrunk by 1 lately. Our calculations also showed that HAS isn’t among the 30 most popular stocks among hedge funds. We’re going to review the latest hedge fund action encompassing Hasbro, Inc. (NASDAQ:HAS). 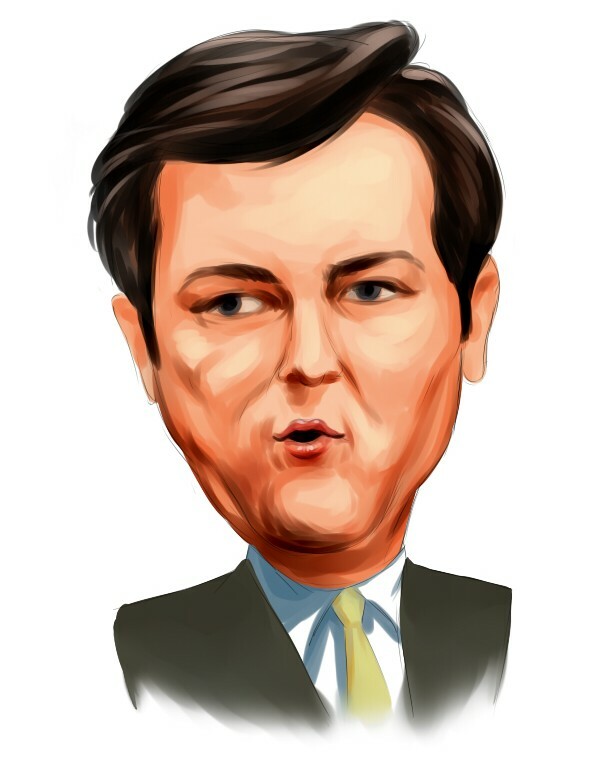 How are hedge funds trading Hasbro, Inc. (NASDAQ:HAS)? Heading into the first quarter of 2019, a total of 19 of the hedge funds tracked by Insider Monkey held long positions in this stock, a change of -5% from one quarter earlier. By comparison, 28 hedge funds held shares or bullish call options in HAS a year ago. With the smart money’s capital changing hands, there exists a select group of key hedge fund managers who were upping their stakes substantially (or already accumulated large positions). More specifically, Point72 Asset Management was the largest shareholder of Hasbro, Inc. (NASDAQ:HAS), with a stake worth $60.9 million reported as of the end of September. Trailing Point72 Asset Management was Renaissance Technologies, which amassed a stake valued at $53.4 million. AQR Capital Management, Balyasny Asset Management, and Chilton Investment Company were also very fond of the stock, giving the stock large weights in their portfolios. Seeing as Hasbro, Inc. (NASDAQ:HAS) has witnessed declining sentiment from the smart money, it’s safe to say that there were a few hedge funds who sold off their full holdings by the end of the third quarter. It’s worth mentioning that Israel Englander’s Millennium Management said goodbye to the biggest stake of all the hedgies followed by Insider Monkey, worth about $40.4 million in call options, and Sander Gerber’s Hudson Bay Capital Management was right behind this move, as the fund dumped about $6.3 million worth. These moves are intriguing to say the least, as total hedge fund interest was cut by 1 funds by the end of the third quarter. Let’s also examine hedge fund activity in other stocks – not necessarily in the same industry as Hasbro, Inc. (NASDAQ:HAS) but similarly valued. These stocks are Eastman Chemical Company (NYSE:EMN), Tractor Supply Company (NASDAQ:TSCO), J.B. Hunt Transport Services, Inc. (NASDAQ:JBHT), and SVB Financial Group (NASDAQ:SIVB). All of these stocks’ market caps match HAS’s market cap. As you can see these stocks had an average of 33 hedge funds with bullish positions and the average amount invested in these stocks was $548 million. That figure was $255 million in HAS’s case. Tractor Supply Company (NASDAQ:TSCO) is the most popular stock in this table. On the other hand J.B. Hunt Transport Services, Inc. (NASDAQ:JBHT) is the least popular one with only 25 bullish hedge fund positions. Compared to these stocks Hasbro, Inc. (NASDAQ:HAS) is even less popular than JBHT. Considering that hedge funds aren’t fond of this stock in relation to other companies analyzed in this article, it may be a good idea to analyze it in detail and understand why the smart money isn’t behind this stock. This isn’t necessarily bad news. Although it is possible that hedge funds may think the stock is overpriced and view the stock as a short candidate, they may not be very familiar with the bullish thesis. In either case more research is warranted. Our calculations showed that top 15 most popular stocks among hedge funds returned 19.7% through March 15th and outperformed the S&P 500 ETF (SPY) by 6.6 percentage points. Unfortunately HAS wasn’t in this group. Hedge funds that bet on HAS were disappointed as the stock returned 7.4% and underperformed the market. If you are interested in investing in large cap stocks, you should check out the top 15 hedge fund stocks as 13 of these outperformed the market.